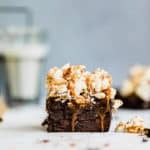 Salted Caramel Popcorn Brownies- The most decadent brownies ever!! Whether you serve these for game days or just plain pregnancy cravings, you won’t regret a thing! My dear blogger friend Lindsay is having not one but two darling twin boys super soon, and I just could not wait to celebrate her. Lindsay is one of the sweetest people I know, literally and figuratively. She runs the decadent blog Life, Love and Sugar, and I met her around the time I first started my blog. I hit it off right away with her and my other homie Julianne, both of whom I absolutely adore. Whenever we hit a conference or retreat together I know we are going to have a blast. We have even gone to an NBA playoff basketball game together! Lindsay also happens to be my baby partner in crime. We both went through our IVF procedures together just weeks apart and shared our entire experience. It was such a help having her there for us to compare notes. We talked all of the time and sent each other photos during our process just to keep each other in the loop. We both truly believed we would get preggers on the first try, and we did. I’m so excited for her, and her babies on the way!!!! I’m sure our kiddos will be the best of online buddies. With her babies on the way and my baby on the way as well (due date is the 27th), I knew I just had to celebrate my girl who has been through so much to get to this point. And I needed the most decadent treat imaginable for my fellow princess of desserts. Because I’m on baby watch, recipe development is pretty much out of the question so I decided to turn to my wall of cookbooks which I haven’t cracked open but have wanted to crack open for some time now. 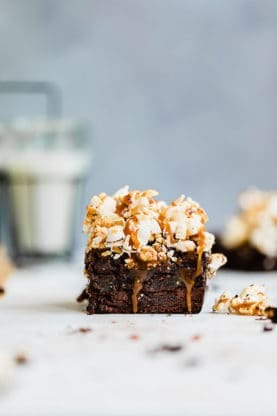 These Salted Caramel Popcorn Brownies immediately caught my eye from my friend Irvin Lin’s cookbook Marbled, Swirled and Layered. First of all, Irvin is a dessert genius and such a pleasure. I wanted to make every single recipe in his cookbook. The flavor combinations are wild yet comforting. They just work! You just pick up this book because these salted caramel popcorn brownies are a hit! Decadent, rich and over the top. Basically everything in the world that you would want in a brownie is in this recipe. They are beyond perfect for the Super Bowl coming up or just downright perfect for any chocolate craving heading your way. In fact, I thought about pregnancy cravings immediately after seeing this recipe in his cookbook. I couldn’t have picked a better recipe than this to share! So here I am raising a mocktail to my boo Lindsay! I wish you so much happiness and joy as your beautiful babies enter the world soon!!! Make sure you check out all of the other bloggers celebrating my girl today below. The most decadent brownies ever!! Whether you serve these for game days or just plain pregnancy cravings, you won't regret a thing! Preheat the oven to 325 F. Lightly coat a 9x13 inch metal baking pan with cooking spray and then line it with parchment paper, with 2 inches of the paper overhanging the edges of the pan. Combine the flour, cocoa powder, baking powder, and salt in a medium bowl. Using a balloon whisk, vigorously stir the dry ingredients together until they are uniform in color and well blended. Place the unsweetened chocolate and butter in a large microwave-safe bowl and microwave for 45 seconds. Stir and microwave in 30-second intervals until the chocolate mixture is completely melted. Add the sugars to the chocolate mixture and beat with a balloon whisk by hand for about 30 seconds. Add the eggs one at a time, beating to incorporate between each one. Add the vanilla and beat to incorporate. Add the dry ingredients and, using a large spatula, fold them in until just incorporated and there are no more dry pockets. Fold the bittersweet chocolate into the batter. Scrape the batter into the prepared pan and spread evenly. Bake until a toothpick inserted in the center comes out with some crumbs attached, 30 to 35 minutes. Let cool completely on a wire rack before adding the caramel popcorn. Place the oil and salt in a large Dutch oven or pot. Add 3 popcorn kernels to the pot, cover with the lid slightly ajar to let steam release, and turn the heat to high. Cook, shaking the pot occasionally until the kernels pop. Remove the pot from the heat and add the rest of the popcorn kernels. Shake the pot to coat with the oil and salt and wait 30 seconds. Return the pot to the stovetop and reduce the heat to medium-high. Cook, with the lid slightly ajar and shaking the pot occasionally, until there is a 2-second interval between popping. Remove from the heat and pour the popcorn into a large heatproof bowl. Combine the granulated sugar and corn syrup in a large pot, preferably one with a silver or light-colored bottom (so you can see the color of the sugar). Turn the heat to medium-high. As the sugar starts to melt and turn brown on the bottom and at the edges, stir with a wooden spoon or paddle to encourage the unmelted sugar to melt and caramelize. Continue to cook until all the sugar has reached the color of an old penny. Remove from the heat and add the cream and butter. The caramel will steam and bubble up, so do this carefully. Place back over medium-high heat and cook, stirring to dissolve any hardened bits, until the caramel reaches 245F (firm ball stage). Stir in the kosher salt. Using an offset spatula or butter knife, quickly spread a thin layer of caramel over the brownie, making sure the caramel reaches the edges. Pour the rest of the caramel over the popcorn, tossing the popcorn to coat with caramel. 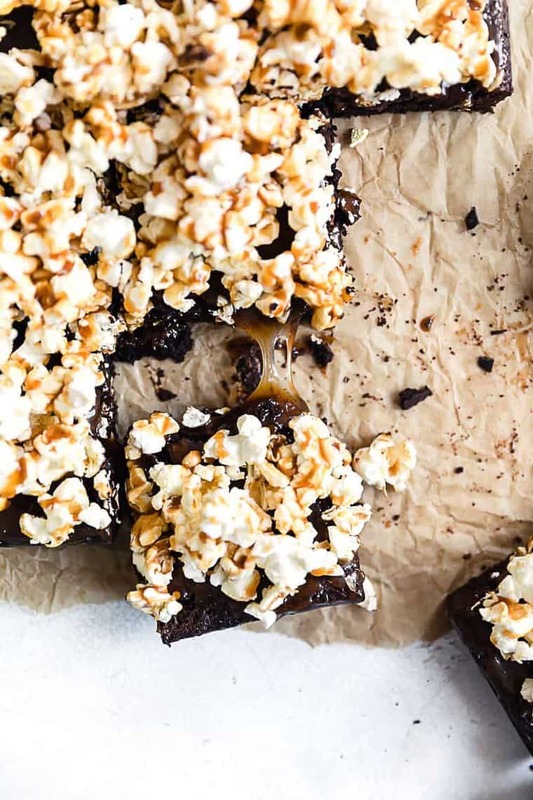 Pour the still-warm caramel popcorn onto the brownie, and pat the popcorn down with a heatproof spatula or with a piece of parchment or waxed paper to create a layer of popcorn over the brownie. Sprinkle with the finishing salt and let cool to harden. 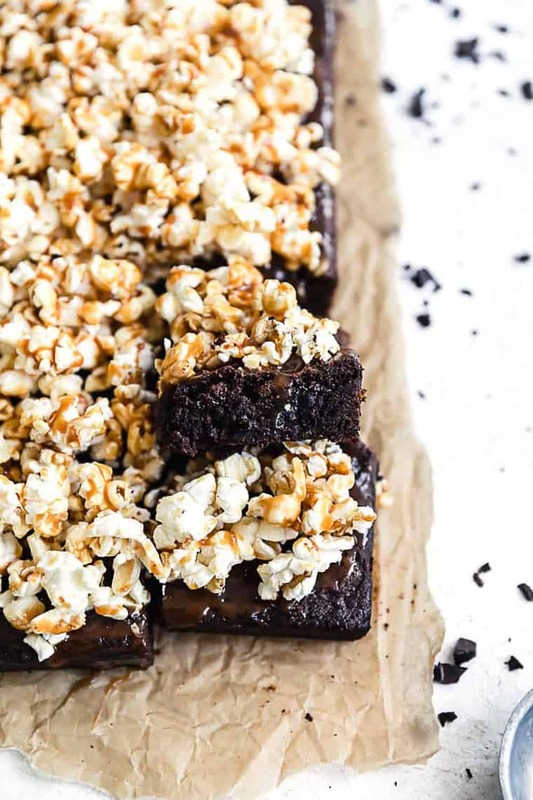 Once the popcorn has cooled and hardened, remove the entire brownie from the pan by grabbing the overhanging parchment paper and lifting straight up. Transfer to a large cutting board and, using a sharp serrated knife, cut and serve. Those brownies look insane! As a lover of popcorn I give this a big thumbs up – and am slightly jealous at those who received them. OH MY GAWWWWD. 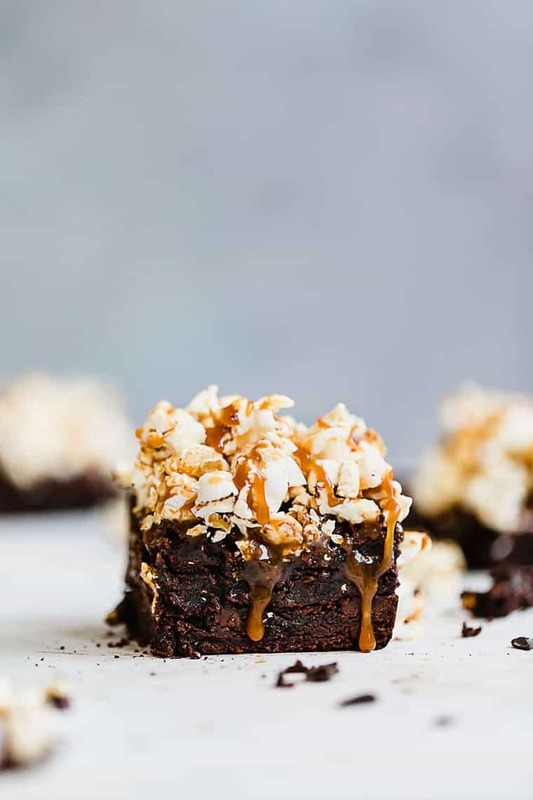 I’m totally dying over these….like…putting salted caramel popcorn on top of brownies is totally next level! Thanks for sharing this recipe! I will try this yummy recipe at my kitchen as soon. I am just spellbound. This looks so yummy and delicious. I will surely never forgot that NBA game, well the game I could forget but the ride on the back of that bike cart thing I will NEVER forget! Oh and maybe the trip to Target with that Uber driver. LOL. I am SO happy for you and Lindsay both! Thank you so much for helping us celebrate! NBA playoff games?! You guys *must* be fab friends! 🙂 These brownies are out of control! Two of my favorite things in one treat — LOVE it! Sweet and salty the perfect combination! Oh my goodness, these look SO good!! My kids would LOVE them!! YUM!!! YUM! These brownies look so decadent and absolutely delicious! Love the idea of combining chocolate with salted caramel popcorn! Oh girl, these are incredible!! That salted caramel…yum! I am all in anytime I read the words salted caramel! I never thought to pair popcorn and brownies! Looks delish! I love him and I have to get his cookbook. He is one of the very first food bloggers I fell in love with. These look great! GIRL you know I love these – caramel AND brownies?? HEAVEN! My mouth is totally watering! These look totally amazing! And hooray for babies!!! Hooray for all the babies! Woot woot!!! We are at the homestretch homie!!! So close!!! Why have I not made these yet?! So fun! I know right boo? So good!